As Taberite Brayden Peters continues to ascend to bigger stages in his hockey career, he has managed impressive performances on every single one. 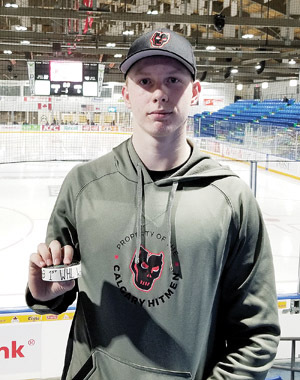 His latest was his first Western Hockey League start in net for the Calgary Hitmen — and win, impressively stopping 30 of 32 shots (.938 save percentage) that came his way in a 6-2 victory over the Swift Current Broncos on the road last Wednesday. Peters helped the Calgary Hitmen to their fourth straight win. Recently called up from his Lethbridge Hurricanes ‘AAA’ midget team where he has enjoyed a sparkling 1.74 goals against average, Peters was given the nod to start between the pipes. “Heading up to the game and getting to the rink, I wanted to treat it just like any other game and playing hockey again. When I made that first save, it just seemed natural again,” said the 16-year-old Peters of getting those pre-game jitters out of the way, having been called up two pervious times as well, with this being his first tour of duty as a starting goaltender with the Calgary Hitmen. Also helping Peters ease his way into his WHL transition was a Hitmen offence that netted four goals in the first period to lessen the burden, along with a strong blueline that made the Taberite’s job more manageable. Peters did manage to stop a penalty shot in the second period. The Hitmen were on the power play and the Broncos were able to disrupt a play at the point where a player broke in and then was tripped up. “I wasn’t really nervous or stressed. I played my game and outwaited him, where he tried to go to his backhand and I didn’t bite on his fakes,” said Peters. Brayden stayed up with the Hitmen until Saturday and then went back to his ‘AAA’ club in Lethbridge on Sunday for a game against Okotoks. Peters was drafted by the Calgary Hitmen in the fifth round of the 2017 WHL Bantam Draft, 95th overall, and the first goaltender the Hitmen would take.